Jerico Domingo chats with attendees. A member of Export Quality Collective was seated at each table to facilitate conversations. At a film screening and community dinner in Pilsen on Dec.1, Filipino dishes took center stage. Attendees explored the cultural, historical and political significance of food while feasting on classic Filipino meals with their hands. 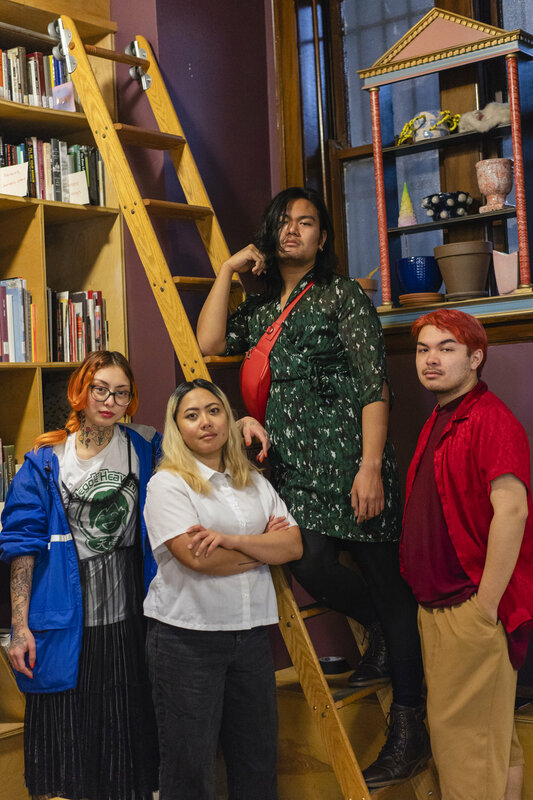 Four of 12 members of Export Quality Collective, a group of mostly Filipinx art students who met at the School of the Art Institute of Chicago. Export Quality Collective, a group of 12 Filipinx-American artists based in Chicago, Los Angeles, New York and Japan, premiered their second video in a series called “Nakikita: On Food and Authenticity,” which talked about the history of Filipino cuisine and how it relates to identity. “I want people — from watching this video and like having these conversations — to like, want to engage with their culture through eating it, through cooking it, [through wanting] to learn more of that — the history of the food,” said Jerico Domingo, a member of Export Quality Collective who co-produced the video. Through interviews with chefs, artists and community organizers who are passionate about Filipino food, the video explored what authentic Filipino food is in the midst of being a culinary trend that’s gaining popularity in the West. The video concluded with the idea that, because of its history and its very nature of being technique-based, it is difficult to box Filipino food into the boundaries of what is authentic and what isn’t. People feast on rice, lumpiang shanghai, grilled pork, pinakbet, adobong pusit, mango and other Filipino dishes. For instance adobo, arguably one of the most popular Filipino dishes, refers to a method of marinating and browning chicken or pork in soy sauce, vinegar, and/or coconut milk. Yet adobo is just one name for a dish that can take dozens of different forms and ingredients vary depending on the cook’s region, said Chef Sharwin Tee in the video. Substitution of ingredients is a common part of cooking Filipino food, added Tee. Because of this, Tee does not believe in the existence of authentic Filipino food. The Philippines’ colonial history also blurs the lines of what is considered authentic, according to the film. People watch the video, which explores the intersections of concepts like food, identity and authenticity. The Philippines was colonized for over 300 years by Spain, more than 43 years by the U.S. and three years by Japan. That history permeates many aspects of Filipino culture, especially food. Food is what grounds some people in their identity. This was the case for Paris Jomadiao, a member of Export Quality Collective who spoke in the video. “The moment you get to America, everything about your culture this country tries to erase,” Jomadiao said. So Jomadiao cooks to stay connected to her culture. After the film screening, members of Export Quality Collective facilitated conversations about food and identity over rice, lumpiang shanghai, grilled pork, pinakbet and other Filipino dishes that were served on banana leaves. 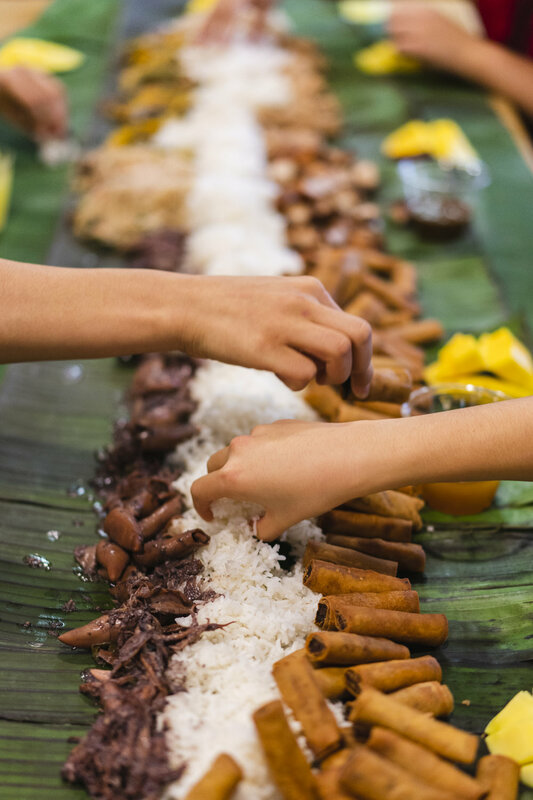 Everyone used their hands to eat, which is a Filipino tradition called “kamayan.” They wanted to break the stigma that comes with eating with one’s hands and to “force conversation and force intimacy,” Acuña said. That space was important to Ramona Roy, who used to live in Hawaii. Compared to Chicago, the Filipino community in Hawaii was more visible and easier to find, she said. “Nakikita,” Filipino for “visible,” examines topics that are not often discussed in the Filipinx community. The third video in the series will explore multi-racial identity. Export Quality Collective is planning on organizing another community event when the video premieres.